One thought, and one thought alone, struck Akane as she opened her eyes. The sunlight streamed through the window, reflecting off the ceiling and dazzling her eyes; the sounds of the birds and the rustling of trees filled her ears; the cotton blankets wrapped around her enveloped her skin in their warmth - and yet, the thought persisted. She sat up slowly, clutching her forehead as a stinging headache whipped across her mind, its touch briefly excruciating. She blinked, wincing at the pain, and then it was gone, leaving behind a vague fuzziness. The memory of dozens of voices calling to her washed over her mind and, for a moment, she imagined she could hear them again. Just as quickly as they appeared, however, the voices vanished into silence, leaving Akane alone. A quiet creak filled the air, but to Akane it was like a gunshot - she jumped, her body spinning toward the sound of the noise. Ranma stood in the corner, her bright red ponytail highlighted by the sunlight against the rest of her body, which remained hidden in the shadows. She stepped forward, the old wooden floor creaking once more as she did, and stopped as her face came into the light. She bore an expression that seemed to be a combination of apprehension and curiosity. "Ranma?" Akane asked, peering at the other girl. "Are you alright?" "I was about to ask you the same thing," Ranma replied, the tension seeming to ease out of her face as she spoke. She attempted a smile. "You gave me quite a fright yesterday." Akane thought for a moment, trying to remember the details of the preceding day. It was strange, she recalled speaking with Happosai, but after that, her memory dissolved into a blur. She could recall shapes, colours, the sound of Ranma's voice, but nothing solid, nothing real. No matter how hard she tried to remember, the events slipped through her mind's grasp like a dream forgotten, a vivid image scattered into nothingness the moment her eyes opened. "No, I ... I don't remember," Akane said at length, looking nonplussed. Ranma stepped toward Akane and sat gently upon the bed alongside her. She let out a long sigh and rested her chin in her hand, absently stroking a small scar on the side of her neck with her thumb. Akane watched the redheaded girl for a time, suddenly aware of just how small she was. The bed had barely shifted as Ranma lowered her weight onto it, and as she slouched forward it became apparent just how tiny she was. Where once Ranma had seemed to tower, ever confident, over her, Akane now found herself silently looking down upon this frail, weary-looking person, a girl who looked little more than a child. "What do you remember?" Ranma asked, turning her head to look at Akane. Her eyes were dull and, despite her youthful appearance, Akane saw in that moment the toll that eight-hundred-and-ninety-four years of life had taken on Ranma. She had never seen the Saotome girl looking so tired before. "I, uh," Akane stammered, trying to tear her eyes from Ranma's, "I remember talking to Happosai, about ... about ...."
"About what?" Ranma prompted, turning and raising one leg up to rest on the bed. Her eyes bore into Akane, quiet apprehension giving way to restless curiosity as she waited on the Tendo girl's next word. "Dragons," Akane finished, her voice dreamy, the word barely more than a whisper. She looked up at the ceiling, mulling the word over for a time, mouthing it silently as if trying it out. Her mouth drew closed as she lowered her gaze to look once again at Ranma. She smiled, almost laughed. "Dragons." Ranma let out a long sigh of relief, and finally managed the smile she had been attempting. She reached forward and took Akane's hand into her own, curling her fingers around her companion's. "I was afraid you wouldn't remember anything." "Your hand," Akane commented, a tinge of surprise in her voice. She glanced down to the point of contact, mouth open slightly as Ranma's palm drifted across the tiny hairs on the back of her hand. "It's warm." Ranma blinked in surprise, looking down at Akane's hand. She tried to pull her hand away, but Akane gripped it firmly. 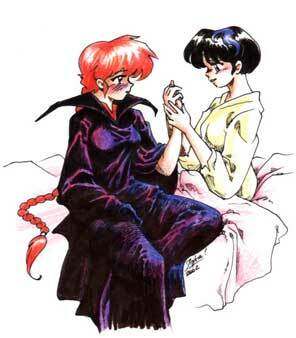 "It used to be so cold," Akane commented, raising Ranma's hand with her own and pressing her other hand to it. She clasped it, sandwiching it between her own, and ran the tips of her fingers gently along Ranma's skin. "What did you do?" Akane looked up at Ranma's face, absently stroking the other girl's hand with her own. Ranma looked strangely flustered and a moment passed, the redhead appearing unsure what to say. Akane tilted her head, curious. "I didn't do anything," Ranma said suddenly, snatching her hand away. She placed her hands together in her lap, out of Akane's reach. Turning her eyes away, she stared at her own hands. "I'll ... wait for you outside. Come and talk to me when you're feeling up to it." Akane's eyes widened, as a flash of remembrance illuminated her mind. She remembered Happosai's words and swallowed, her mouth suddenly dry. Ranma turned, just in time to see Akane charging towards her, Shoryoutensei gripped firmly in one hand. The Tendo girl skidded to a halt a short distance in front of her and lifted an accusatory finger to point at her. "What?" Ranma asked, taken by surprise. She had expected Akane to be a little delicate, not to come rampaging out of the cabin like a wounded bull. "You never said ANYTHING about being a dragon!" "I didn't say I wasn't a dragon either," Ranma replied, with a shrug. "Would you have come with me if I had told you from the beginning? Or would you have dismissed me as insane, stayed where you were, and died?" "That's not the point!" Akane fumed. "You said you were being honest with me, Ranma Saotome, and you damn well lied anyway!" "I did what I had to," Ranma said, turning away. "For that I am sorry." "Don't turn your back on me," Akane continued, anger in her voice. "Don't you dare ignore me." "Akane, we don't have time to argue!" Ranma shouted, whirling back upon the Tendo girl. "Right now there are fifty, a hundred, two hundred, who knows how many hunters headed right toward us, and they all want to kill you as painfully as possible. Don't you understand?" "And why should I even believe that?" Akane demanded. "Everyone we've met has been after you, not me." "That is because," Ranma said with a growl, drawing her face close to Akane's, "they know that to get to you, they have to go through me, and that as long as I draw breath I will rip out the heart of anyone who so much as harms a hair on your head. They understand that, why can't you?" "I ... damn it," Akane said with a sigh, visibly shrinking in stature before Ranma's intense glare. Faced with such strength of will, it was hard -not- to believe her. "Akane, I have sworn to protect you," Ranma said, her voice growing quiet, "and I am not about to give up that promise for anyone. Not even for you. That is why we can't waste time arguing about pointless things." "I hate this," Akane whispered, turning away from Ranma. She stepped toward the still waters of the pond, her shoulders slumping. "Why me? Why are all these people after me? What did I ever do to anyone?" "You are Lady Ryujin the Blue, Mother of Life and Bearer of Creation," Ranma said, crossing her arms. "with that identity comes many enemies." "What the hell does all that -mean-?" Akane asked, sighing in frustration. Ranma, perhaps wisely, did not answer. "How can I be any of those things? I'm just ... me. I'm the same as I've always been." "What happened to my hair?" Akane exclaimed, raising a hand to touch at the large streak of deep blue that ran through her locks. She clutched at the blue hair with her fingers, tugging and pulling at it. "When did this happen?" "A few days ago," Ranma replied. "It's a sign of the emerging dragon. It's nothing to worry about. The same thing happened to me a long time ago." "Really?" Akane asked, peering over at Ranma, her fingers still clutching her hair. "It happened to you?" "Mm," Ranma said with a nod. She brushed the back of one hand against her ponytail. "My hair was black when I was young." "That is really weird," Akane said, returning her attention to her reflected visage. She ran her fingers through her hair, adjusting it slightly. A sigh escaped her. "I _guess_ blue looks kind of good ...."
"Get used to it," Ranma commented. "One day it will all be blue. I think ... I think it suits you." Akane smiled a little at the compliment, and turned her attention back to the still waters. "Blue it is, then, I guess." "Awakening the dragon brings many changes, Akane," Ranma said, stepping up behind the Tendo girl. "Your hair is the least of them. You'll need to be careful from now on - there are many who do not like the company of dragonkind." "So what if I -am- a dragon," Akane muttered, letting her hand drop. "Even if I am, I've never hurt anyone, and I don't plan on it. Why can't they leave me alone?" "You have much to learn, young one," Ranma observed, rubbing her forehead. "Such naivety will only lead to your death." "Don't call me 'young one'," Akane grumbled. "It makes me sound like a child." She pondered for a time why she had so readily accepted what Happosai, and now Ranma, had told her. In a way, at some level, she supposed, it made sense. She had never felt truly alone, even when she was by herself. She had always felt the warmth of another; she had assumed it was her conscience, her superego, or whatever it was supposed to be called. The thought that it could have been another being inside her, trying to communicate with her all these years, did not surprise her as much as she expected. Her thoughts turned to her martial arts, to the tournaments she had won and the many battles she had fought. Always, without fail, she had fought fairly and evenly, always striking to win the fight rather than injure her opponent. It would only make sense for one concerned with life and creation to be averse to damaging that which she creates. Akane sighed. She didn't really know what to believe. As bizarre as it sounded, perhaps this dragon theory wasn't so far fetched. She had always felt a little different to the other students at her school, and even to her father. The only person she had ever felt a connection with was her mother, and she died before Akane had a chance to truly get to know her. A dragon? She couldn't even begin to comprehend what it meant to be a dragon. She still felt like an ordinary human; although, if she was a dragon, she had no way of knowing what an ordinary human was supposed to feel. No matter which way she steered her thoughts, she found nothing but dead ends. "So what does it all mean?" she asked. "What am I supposed to do?" "I honestly don't know," Ranma replied, moving closer to Akane. "For now, our priority is to avoid the hunters." "For how long?" Akane asked, looking over her shoulder at Ranma. "Are they going to be chasing me for the rest of my life?" "If we can find out why the hunters are trying to kill you, perhaps we can put a stop to it," Ranma offered. "But for now, we must concentrate on keeping you alive." "So I guess that means we're on the run again?" "No," Ranma replied, something of a smile coming to her lips. "Not quite." "I don't think I want to do this," Akane called out, a worried expression on her face. She wrung her sweaty palms together nervously. Ranma smiled from her position in the middle of the pond. The water beneath her feet was frozen solid in a small circle around her, easily supporting her weight. It wobbled slightly with her movements, but she effortlessly kept her balance. "I told you I would teach you to swim," Ranma called back, balancing the dull edge of her sword on her shoulder. "Ryujin is a water dragon. You must overcome this fear of yours." "No buts, Akane," Ranma said sternly. "We can spare a day here, in this quiet place, to train you. The more ground we can cover before we have to leave, the less we have to cover on the move. This will let you get acquainted with water, and give you some sparring practice at the same time." "I don't see how learning to swim is going to--"
"You have much to learn about yourself," Ranma interrupted. She smiled at the other girl, her face partially obscured by the ever present mist that hovered about her body. She lowered the milky blade of Garyoutensei from her shoulder and gestured for Akane to come toward her. "Now, attack me." "How?" Akane asked, exasperated. "I can't swim!" "Don't worry about that. Just come toward me." Akane sighed, and with a frustrated shake of the head drew Shoryoutensei from its scabbard. She raised the blade, admiring its liquid surface. She had forgotten what a beautiful weapon it was. The blade rippled slightly, as if in response to her silent praise. She glanced toward Ranma, then to the pool of water. The water looked very cold, and very deep. Letting out a deep breath, she closed her eyes, and took a step forward. The icy cold bite of the water engulfing her leg did not come. She held her eyes closed, waiting for it to arrive, but it did not. Instead, all she could feel was the cool breeze blowing past her, and a slight, yielding warmth beneath her foot. Slowly, gingerly, she opened her eyes. Ranma smiled at her, looking amused, her sword once more slung over her shoulder. Akane pondered for just a moment that it was the first time she had ever seen Ranma looking truly amused. That moment passed, and with it that idle thought, quickly replaced by a loud, insistent question - what the hell is going on? She slowly forced her eyes to look downwards, commanding herself to ignore the screaming instinct that told her not to look down, to look away, and step back onto solid ground. When her gaze reached her foot, her eyes shot wide open in shock. Where her foot touched the water it pressed back against her, more dense than the water surrounding it, seemingly able to support her weight. She wiggled her foot slightly, and was suddenly reminded of a water bed she had jumped up and down upon as a child when her father took her shopping many years ago. She swallowed nervously, watching the water shift to support her with every movement of her foot. She glanced up at Ranma, her mouth hanging slightly open, and slowly nodded. Almost without realising it, her second foot joined the first upon the surface of the pond. She wobbled back and forth, swinging her arms in small circles as she teetered off-balance; slowly, as the wobbling of her body stopped, so did the movement in her arms. Her gaze stayed firmly upon her feet, held in place by an intense fear that as soon as she looked away, the water would swallow her whole. Her knees shook slightly as the blood drained from her head, her face turning pasty white. "Akane," Ranma called, stepping over toward her. "Akane, look at me." The water's surface froze beneath Ranma's feet with each step she took, a small patch of ice appearing moments before her skin made contact. She stepped nimbly toward the Tendo girl, the trail of ice she left behind dissolving just as quickly as it had formed. Akane dared a quick glance up at Ranma and, after she was satisfied the water wasn't about to collapse beneath her, turned her head toward the other girl, a flabbergasted look upon her face. "What the hell did you do?" she demanded, her pale white skin shaking. "I didn't do anything," Ranma replied. She drew near and lowered herself, squatting nearby. "You did that." "I ..." Akane stuttered, staring with disbelief at the redheaded girl before her for a moment before looking down once more. "I did?" Ranma nodded, and gestured down towards the water. "Touch it." "You didn't want to fall into the pond," Ranma continued, as Akane reached toward the surface, lowering herself to one knee. "And so the water held you." Akane slowly lowered her palm toward the surface of the water, watching it shimmer in the sunlight, liquid glass, seeming somehow drawn upwards toward her hand as it came close. "And now you want to touch it, to reach out and understand it," Ranma observed, watching the slow descent of her companion's hand. The water pushed upwards, a watery imprint the size and shape of Akane's hand raising ever so slightly from the surface to greet Akane's skin. "And so the water rises to greet you." 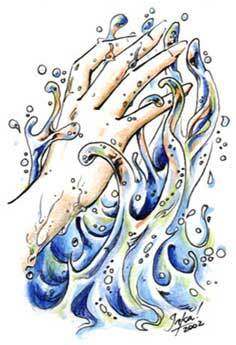 "How ...." Akane stammered, holding her hand gently against its watery cradle. She wriggled her fingers up and down, eyes watching in wonder as the water curled itself around her fingers, intertwining itself with her in a warm embrace. "How is this possible?" "It is all because of you," Ranma said with a smile. "Water is the very heart of your domain. Life needs water, life -is- water; you are the bearer of that water." "I don't ... I don't understand," Akane whispered, watching the swirling patterns dance through the water, surrounding her hand. Warmth, a refreshing and soothing warmth, radiated from the surface, filling Akane with a sense of energy, of wellbeing. "How can I do something like this?" "Just as death is my domain, life is yours. I burn and purge the dead, you craft and create the living. It is your duty, the duty you have been performing since you were born, even without knowing it." "This is too much, too fast," Akane said, her voice rising in a panic as the liquid grasped at her hand. She jumped, letting out a gasp as its grip tightened. The more her panic grew, the tighter the hold became. "You don't need to understand," Ranma replied, rising slowly to her feet. "You'll remember in time. I'm just helping you take the first step. Now come on, let's--"
"Stop!" Akane yelled, yanking her hand free as she jumped to her feet. She fixed Ranma with a wild-eyed stare, and held up her hand. "Stop pushing! This is too much, I need ... I need time to think ...."
"We don't have time," Ranma replied, returning Akane's stare with an intent glare. "We must push on." "I said stop!" Akane cried, turning and storming back toward the cabin. "I don't want any of this!" "You don't have any choice!" Ranma bellowed in retaliation, charging forward onto solid ground. "You can't change who you are. There is no other Ryujin!" "I don't care," Akane simmered, stopping in her tracks. "Since I met you, I've left my home and everyone I knew. I've had people chasing me, people trying to kill me, and someone trying to tell me I'm a dragon. I don't want any part of it!" "Akane," Ranma said with a sigh, drawing closer behind Akane's back. "I just want to go home," Akane said, her voice suddenly soft, breaking with emotion as she turned towards the cabin once more. "Please." "We can't change who we are, no matter how much we may want to," Ranma said quietly, a twinge of sadness in her voice. "I know it's hard, Akane. I know it's new, and it's strange. It's also the truth, and hiding from it won't change it." "I just want to be me," Akane begged, her shoulders slumped in defeat. "I don't want to be Ryujin. I can't be a dragon." "You are the only dragons left," came a new voice, a hoarse whisper. Akane looked up, tears in her eyes, to see Happosai standing before her, a narrow cane supporting his tiny frame. His face, although old and haggard, carried a seriousness that could not be ignored. She sniffed, wiping a stray tear from her cheek. "She is not ready to know this," Ranma protested. "Be quiet, Tatsujin." "No, I will not," Happosai replied, a stern look in his eyes. "Akane, the Elder Dragons are all but extinct. They were betrayed and destroyed a thousand years ago by the greed of men. Ryujin and Ryukyu are the only living remains of the Kingdom of Dragons. If you die, the race of dragons dies with you." "What?" Akane spluttered, reddened eyes widening. "Long ago there were many dragons, dragons who lived in harmony with mankind, acting as their guardians, their gods. Mankind grew greedy for the power of the dragons, however, and turned against those who protected them from themselves." "The dragons were hunted, burned, and destroyed," Happosai continued, his voice growing louder. "Every single one was found and killed. But the hunters were not as thorough as they had thought. Centuries earlier, two dragons were banished to the earthly realm, cast down from dragonhood to the world below. They survived the purging and remained invisible. Those two dragons were Ryukyu, the Lord of Death, and Ryujin, the Lady of Life." Akane turned and looked over her shoulder at Ranma; the redheaded girl had her eyes closed, her head cast down. Akane stared, watching the anger wash over Ranma's face as Happosai spoke. "But they could not remain invisible forever. The hunters learned of them, and have been hunting both dragons ever since. There are groups - armies - dedicated to hunting you down. You -are- Ryujin, Akane, and you are the last hope of the Elder Dragons." "I said stop," Ranma growled, her voice shaking. "No more secrets, Ryukyu," Happosai growled in return. "She has a right to know." "Kayoko knew!" Ranma exploded, lunging at Happosai. She grabbed the old man and threw his frame up against the hard wooden wall. "Kayoko knew everything, and look what happened to her!" "Kayoko made her own choices," Happosai choked, the wind knocked out of him by the impact. "Let Akane make hers. It's wrong to leave her in the dark." "How dare you question my methods," Ranma bellowed, her face red with anger. "Look where your methods have got you!" Happosai spat. "Nearly a thousand years, and what do you have to show for it?" "Damn you, Tatsujin," Ranma seethed, her hands shaking as she held him. "Is he telling the truth, Ranma?" "Akane?" Happosai asked, looking over Ranma's shoulders at Akane, who had walked off into the distance during the argument. Ranma turned and looked as well, loosening her grip on the old man. Akane stood in the centre of the pond, pulling the tip of Shoryoutensei slowly back and forth in a gentle arc in front of her feet. She watched the ripples echo out across the surface of the pool for a moment, before raising her eyes to look at Ranma. Ranma stared for a moment, her eyes softening. She sighed and nodded, lowering Happosai to the ground. She gave him a glare, then turned away from him to address Akane. "He's telling the truth." "Why didn't you tell me?" Akane asked, her voice low. The swinging slowed to a stop, the tip of Shoryoutensei holding its place against the water's surface. The ripples continued for a time, each one weaker than the last, until eventually, the pond was once more still. "This isn't just about me. This is about a whole -race-. Gods ...."
"I ..." Ranma began, trying and failing to hold steadfast under the watch of Akane's wounded eyes. She slumped her shoulders and looked away, speaking in little more than a whisper. "I was trying to protect you." "Protect me from the truth?" Akane asked, her eyes firmly fixed upon Ranma. "Did you protect my mother as well?" "I didn't tell her," Ranma replied, the strength drained from her voice. "How could I tell her?" "She would have helped you if you had," Akane spoke quietly, her voice neutral, emotionless. She looked up, fixing her eyes upon Ranma. "She would have gone with you." Ranma recoiled at Akane's words, the implicit accusation they carried. She averted her eyes from Akane's face, unable to match her ward's gaze as the heat of humiliation flushed her cheeks. "I gave everything I had to protect your mother." "If you'd given her a chance to give as well, she might have survived," Akane continued, turning away so Ranma would not see the warm tears that stung her cheeks. "I won't die like she did. I ... don't want to die without knowing who I am, Ranma. If that means staying with you, well ...."
Ranma looked up, a surprised expression crossing her face. Happosai, too, looked surprised at Akane's words. "If you're right, and I am a dragon, then there's not a lot I can do about that," Akane observed, bowing her head. "My mother tried to hide from it, and I'm not going to repeat her mistakes. Is there anything I can do to stop these hunters?" "Let me teach you, let me prepare you. You can fight them alongside me." "You lied to me, Ranma, and I'm never going to forget that," Akane spoke quietly, raising her eyes to fix them firmly upon Ranma. "But I'm willing to do whatever it takes to avenge my mother. If that means continuing this journey, and believing what you tell me, then that is what I'll do." Ranma rose, slowly, to her feet. A look of apprehension flashed across her eyes, a tentative step forward followed. "Then you'll stay?" "I'll stay," Akane said softly, nodding her head. She turned to face Ranma, holding up a hand to stop the redheaded girl from taking another step. "On the condition that you don't keep things from me anymore. If you can't trust me with the truth, I can't trust you with my life." "Okay," Ranma answered, nodding her head. She fixed Akane with a stare, a fiery determination igniting behind her eyes. "I want to teach you, to make you strong. I know that's what you want too." "Then let's spar," Akane said, slowly raising Shoryoutensei. "Water is your ally," Ranma explained, standing a short distance from Akane, the tip of Garyoutensei almost touching the tip of Akane's sword. "Command the water and it will obey. Think fast, adjust and adapt. Be like the water; flow around the obstacles in your path. Stay relaxed, don't be rigid, and above all, pay attention." "I know," Akane replied, an intent look dominating her face. "You don't need to lecture me any more. I already know how to fight." "Not like this, you don't," Ranma observed, rocking back and forth ever so slightly on her perch of ice. "You don't know anything yet." "You enjoy this, don't you," Akane commented, peering across the juxtaposition of two swords to the redhead's eyes. "Enjoy what?" Ranma asked, raising an eyebrow. "Being the teacher," Akane replied. "Being in control. Thinking you know everything and I know nothing." "Perhaps you're right," Ranma admitted with a small smile. It felt good to be back in familiar territory, away from the shaky subject of Akane's mother. "I do have eight hundred years of experience to speak from, you know." "Don't underestimate me," Akane said, matching Ranma's smile with a determined smile of her own. She had much to prove, and she was prepared to do so. "I might just surprise you." "You're welcome to try," Ranma suggested. Akane said nothing, merely nodding her head in silent acknowledgement. Happosai coughed, distracting the two girls, who both fixed him with annoyed glares. The old man smiled, glancing back and forth between the two girls. "First, some rules," he said firmly. "This is a one-on-one fight, restricted to the pond. If one of you leave the pond, if one of you fall in, the fight is over. If one of you call surrender, the fight is over. Besides that, anything goes. Good luck." "Anything goes," agreed Akane. A flash of determination passed behind her eyes as she lowered herself into a fighting stance, bringing Shoryoutensei forward to touch the tip of Garyoutensei. A small flash of light filled the air, a sizzling noise and small trail of steam marking the point of contact. "Ready?" "Ready when you are. Happosai, start the fight, then leave us alone. I don't want there to be any distractions." "Very well," said Happosai, with a nod. "Begin!" The pair circled each other for a time, Akane's steps growing ever more confident as time after time the water did not yield to her weight. Movements that began somewhat hesitant and stilted quickly grew more fluid, relaxed, and confident. Ranma smiled as she watched Akane move across the face of the water, the liquid shimmering like silk beneath her feet. It was astounding, how fast Akane learned. She nodded her head slightly, and Akane nodded in return; the time for delays was over. Akane moved first, lunging towards Ranma, the blade of Shoryoutensei gliding in a smooth, wide arc toward its target. 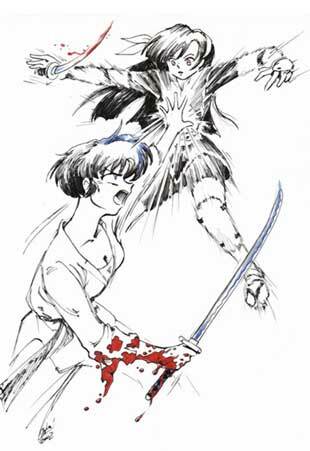 Ranma flicked her blade up past her shoulders to block the strike at an arm's length, and retaliated with a low, sweeping swing across Akane's legs, which would force the Tendo girl to jump. Akane did not jump, however; she twisted away from the blade and rolled over it, raising the water beneath her feet slightly to propel her through the air. She landed cleanly and rolled to a kneeling position, sword held aloft across her face in a guarding position. "Not bad," Ranma commented. "You're improvising. Good." Akane flashed a smile, but did not speak; instead she launched herself forward, driving her sword in a strong stabbing motion. Ranma reacted quickly, pulling herself aside and spinning with Akane's motion. Raising one arm, she drew it back sharply, catching her opponent on the back of the head as she flew past. Akane flailed, her trajectory thrown off by the impact - she landed roughly, forced to roll once again to avoid landing face-first. She rolled too far, however, and skidded to a stop a short distance from the edge of the pond. Glancing behind herself, she let out a sigh of relief. Ranma was smiling at her when she looked forward once more, but the redhead said nothing. Akane raised herself to her feet, the lesson learned. No more uncontrolled charges, no more wild attacks. Ranma had made her point without saying a word. Stepping away from the edge, she lowered herself into a defensive position and waited, observing the redhead's every movement with caution. Ranma remained still, standing in a loose stance with her sword balanced across both shoulders. She tilted her head slightly, inviting Akane to attack. Akane smiled and shook her head, tightening her grip on Shoryoutensei, but otherwise not moving. A silent moment passed, the muted ripples of past motion dancing across the water. The pair were statues, unmoving, locked in a stare that seemed to go on for an age. Eventually, Ranma straightened her head and nodded her approval, seemingly pleased that Akane was willing to wait. A moment later, she was already halfway toward her student, her sword held aloft and ready to strike. The girl was but a red flash that darted across Akane's vision; she instinctively swept her sword upwards, flicking aside a sharp strike aimed at her throat. Another came from a different angle, again barely deflected, followed by another, and another, each varying in approach and intensity, leaving Akane barely able to keep up. Ranma whipped her sword low, the tip arcing through the surface of the water as it passed by Akane's feet. It sizzled on contact, sending a cascade of tiny droplets flying through the air as a rush of steam rose. Akane's eyes widened as she watched the droplets tumble through the air in perfect parabolic arcs, each slowing as it neared the peak of its trajectory, seemingly suspended in midair. She was entranced by the tiny, translucent balls of water, her eyes flitting back and forth between them as the sunlight coruscated colourfully off their forms. She glanced up at Ranma who was still swinging her sword, her movements so slow as to be barely discernable. Akane tried to straighten herself but found she could not, her movements restricted as if she were being held. As she became vaguely aware that her sword had lowered to touch the pond surface, a weighty feeling of apprehension sank into her stomach. By now Ranma had raised her sword once more, a determined look upon her face. Akane looked into those large blue eyes, seeing the sunlit droplets reflected in them; she found herself marvelling at the beauty of the sight, her mouth turning upwards in a smile as she watched the effortless glide of the water through Ranma's eyes. It was enchanting, beautiful in its elegance, a luminescent pattern of droplets that twinkled like the stars themselves. A hot flash of danger surged through her, driving her thoughts back to the match, and the proximity of Garyoutensei to her face. She glanced down at her sword and commanded herself to raise it; her hand lazily lofted the weapon, slowly, but still much faster than Ranma. It came into position at just the right moment, intersecting the milky blade of her opponent in a perfect X. Her training and instinct called out to her, telling her to make a counter strike across Ranma's vulnerable back, to take down the opponent with one blow. She listened and obeyed, beginning the downward motion - only to cease it as a new voice entered her mind, a light, sing-song voice that seemed to hum rather than speak. It was joined by another, and another, and a dozen others, each tiny voice adding to a chorus that reverberated back and forth through the myriad droplets of water. The first emotion she felt was curiosity, followed by surprise as her free hand - seemingly of its own volition - surged forward; her fingers stretched themselves out, her fist flattening out as her palm drove toward Ranma's back. The impact of her hand upon the small of Ranma's back felt almost sensual - a feather light touch that drifted across Ranma's back, warmth radiating from the other girl's body into her fingers - but an instant later, Ranma was sliding across the surface of the pond, leaving behind a trail of blue ice in her wake. Dozens of tiny splashes danced across the surface of the water as the droplets suddenly accelerated, falling like rain at Akane's feet. The Tendo girl blinked, looking at the unmoving black mass sprawled out on the ice before her. What had just happened? Ranma grunted as she shoved the blade of Garyoutensei down into the block of ice that entrapped most of her left arm. The effect was immediate, as the ice cracked and started to sizzle, spurts of water vapour escaping from the many fissures. Akane stepped back and watched carefully as the ice gave way, a deep snapping sound followed by a loud hiss as Ranma wrenched her arm free. The redheaded girl shook the frozen hand back and forth a couple of times and slowly rose to her feet, a grimace crossing her face as she wriggled the fingers back and forth. "You surprised me," she admitted. "I haven't seen that sort of speed in a long time. Here I was, thinking you fought with nothing but brute strength. Seems I was wrong." "I'm sorry," Akane offered, her voice turning upwards in a confused tone. She wasn't sure if she should even be apologising, but something told her it was the thing to do. "I don't know how that happened. I didn't mean to beat you ...."
"Of course you did," Ranma replied, flashing a savage smirk. "You wouldn't have fought otherwise. Don't worry, I'm not angry. I'm just surprised. I wasn't expecting such an improvement so quickly - you really are a ... strange creature." Akane said nothing, unsure of what exactly she was supposed to say. On one hand, Ranma's comments were patronising in the extreme, but on the other, she felt guilty for hitting Ranma quite as hard as she apparently had. The strange thing was, despite the uncertainty she felt, a strong feeling of enjoyment filled her - a sense of achievement. The anger she had felt burning inside her only a few minutes before had completely dissolved. When she sparred with Ranma, she felt as if she were on a completely new level, covering ground that she had never before explored, ground that she had not even imagined before. It was exhilarating in a way, and she found herself wanting to spar again. A reminiscent thought flitted through her mind, a brief recollection of a similar feeling when she had very first met Ranma. The girl had seemed full of promise, a mysterious opponent that seemed to present a genuine challenge. She had not known then just how right she had been in her initial assessment. "Everything seemed to slow down," Akane explained, watching Ranma stretch her arm. "I could see exactly where you were going to attack." "Nothing was slowing down," Ranma replied with a shake of her head. "You were thinking and perceiving more quickly. I was moving quite fast, but you moved faster still." "How?" Akane asked, glancing down at the sword in her hand. A frown crossed her face as she tightened her fingers on its handle. "It's not something I can explain that easily. You'll learn as time goes on," Ranma observed. She lowered her hand, turning her attention once more to Akane's face. She smiled knowingly, "It just means that I won't go so easy on you this round." "This is really weird," Akane said with a sigh. "It took me a while to come to terms with it," Ranma offered. "If it makes you feel better, you've achieved in two days what took me nearly five years." "How?" Akane asked. "How is that possible?" "I don't know," Ranma admitted. "But, the faster you learn, the better our situation becomes. So, right now, this particular gift horse is going to keep its mouth closed." "Gift horse?" Akane asked, a look of confusion on her face. What did horses have to do with anything? "Never mind," Ranma replied, shaking her head. She ran her right hand up and down her left arm, clenching and unclenching her fist. She shook her arm a little, sending small ice flakes flying. "It's just an expression." "You can't control it, can you?" Akane asked, watching Ranma tend to her arm. She glanced down at the gaping hole in the midst of the pond, the ice slowly melting away as she watched. "The water, I mean." "You touch it and it turns to ice. It's as though it's reacting to you, rather than listening to you." "Very perceptive," admitted Ranma. "You're right. I don't have any control over it. Water is your domain, not mine. It's the cloak that freezes the water, not me." "That's right. You made it for me a long time ago." "Waterskin," Akane said with a nod, remembering Happosai's words. She reached out and gingerly pressed her hand to the fabric of the cloak. It did not feel cold as she remembered; it radiated a pleasant heat that encouraged her hand to linger. "It's warm." Ranma said nothing, watching Akane run her hand up and down the cloak. The movement stopped after a while and Ranma turned her eyes up to Akane, whose face carried a curious expression. "How does it freeze water if it's warm?" Akane blinked, the warmth in her hand telling her that what Ranma said was ridiculous; however, as Ranma exhaled, the tell-tale puff of frozen mist rose from her mouth as it always did. She pulled her hand slowly backwards, her eyes widening as realisation dawned. "It's not warm ...."
"... you are cold," Ranma finished. Akane peered down at herself. She didn't feel cold, in fact she felt a pleasant warmth that tingled inside her, lapping at her like the gentle heat of a campfire. It was strange, she had been so used to feeling cold, but the transition to feeling warm had gone largely unnoticed. "It seems your body is remembering faster than your mind," Ranma observed. "Remembering how to be a dragon," Ranma replied, sheathing her sword. "Perhaps it's a good thing. I haven't fully recovered yet, so the stronger you are, the better off we'll be." "Wait, wait," Akane interrupted. "Recovered from what? Two swords through the stomach?" "No, no. Those were nothing," Ranma replied with a chuckle, waving her hand dismissively. She paused for a moment, the mirth leaving her face as she considered her words. "After ... after what happened with your mother, I sealed my strength away. I promised myself that I wouldn't interfere with the life of her daughter the way I interfered with hers." "You didn't do a very good job," Akane replied, an incredulous tone tainting her voice. She arched an eyebrow, wondering where this was going. "Well, no," Ranma admitted, a small smile passing over her lips for just a moment. "I don't suppose I did. I told myself to stay away from you, to avoid drawing attention to you. After a while, though, I could feel you, and I knew where you were. If I knew, they knew. I had to do something about it." "So you dragged me away from home, and through this forest," Akane said, gesturing at the trees that encircled them. "You have to understand," Ranma explained, glancing up at Akane's face for a moment, then looking away. "When I saw you - saw your face - I knew you were different. I knew you had a chance. So I took you, and unsealed my own strength - I thought it would return straight away, but it hasn't. I've been ... having a hard time fighting. It seems I've gotten used to having that strength to fight with." "I didn't want to say anything," Akane commented, scratching the back of her head, "but you did seem to be losing a lot of fights." "My father wouldn't have put it so diplomatically," Ranma observed. "I will protect you to the best of my abilities, Akane, but until I recover ... the stronger you are, the better." "Why are you telling me all of this?" Akane asked, watching the redheaded girl carefully. "You're not exactly inspiring a lot of confidence." "You said no more secrets, Akane," Ranma replied with a shrug. "I have no pride left to wound. If you know about my weakness, you can use that knowledge to survive, and that's all that matters." "You shouldn't say that," Akane admonished, glancing to the ground. Her thoughts turned to her father, to the crushing depression he had gone through for many years after her mother had died. "We all need to have pride." "Pride can be dangerous," Ranma said in reply, "don't forget that, Akane. Now, I believe the score is one-nil to you." "You sound like my father," Akane observed, twirling her sword slowly. "Always turning everything into a lesson or a competition." "No," Ranma replied, giving a knowing smile as she unsheathed her sword again. Stepping back to the centre of the pond, she raised the blade. "Your father sounds like me." Akane gingerly lowered herself to the floor, gratefully taking a glass of water from Happosai as the old man offered it to her. She took a deep gulp of the liquid, letting it soothe her throat as he sat down next to her. "I hurt all over," Akane complained, stretching out her back. "It feels like we've been fighting for hours." "You have been," Happosai commented, gesturing toward a nearby window. The fading remnants of the evening's sun streamed through the opening, colouring the wooden floor a deep orange. "Nearly eight hours, as a matter of fact. I do hope she isn't pushing you too hard, Akane, my dear." "Don't worry about me," Akane replied with a smile, taking another sip. She stretched out one arm and rolled her shoulder, feeling rather more energetic with every sip she took. "I'm not as weak as you think I am." "I don't think you're weak," Happosai countered, the wrinkled edges of his mouth curling upwards in amusement. "It's just that Ranma has never pushed anyone this quickly before." "She must know what she's doing," Akane supposed, glancing over to Happosai, carefully appraising his facial expression. "I certainly hope she does," Happosai noted thoughtfully. "She believes in you, Akane. I just hope her enthusiasm isn't blinding her better judgement. May I offer a piece of advice?" "Sure," Akane replied with a shrug. She had long since become accustomed to people offering her advice. Why not one more? "Don't ... rely on Ranma alone. She will do anything to protect you, but she doesn't always make the right decisions. Don't let her tell you what to do without thinking about it for yourself." "It doesn't sound like you have much confidence in her either," Akane said softly, a thoughtful look on her face. Was she really supposed to trust her life to Ranma, a person Happosai didn't trust? A person who didn't trust herself? "No, you're wrong," Happosai replied with a shake of his head. "I believe in Ranma. She will not rest, or sleep, or leave your side until you are safe. Her entire life revolves utterly and completely around you." Akane glanced away, peering through the window at Ranma, who kept a motionless vigil in the twilight outside. She let out a sigh, utterly at a loss. What was she to make of this girl? Of this situation? "You owe it to her to be worthy of such devotion, Akane," Happosai added in a quiet voice. "You owe it to her to survive. If that means going against her judgement sometimes, so be it. You know your own limits better than she does. Just trust your instincts, is all that I'm saying. Blindly following Ranma did not work for any of your predecessors." Akane sank into silence, gazing down into the glass of water, watching the ripples bounce back and forth within its boundaries. She stared at her own reflection, wondering just how many of her predecessors had failed before her, where they went wrong. How could she hope to live up to this task if it had killed all of her ancestors? How could she complete a task that she didn't even understand? She knew Happosai was right, and trusting her own judgement was in many ways a strong part of her nature, but Ranma had been sending out very confusing signals from the moment she had walked into Akane's life. On one hand she implored Akane to trust her with her life, but on the other she admitted she was too weak to really protect her. Happosai said, in slightly different words, the same thing. How could she trust Ranma? How could she believe her? "What am I supposed to do? Where do I go from here?" "Survive," Happosai replied with a weary smile. "Live long enough to find out who your enemies are and what they want. They hunt you for a reason, if you can find out what that reason is, perhaps you can stop them." "I don't even know where to start," Akane countered, watching the water's surface as it rippled and curled, contorting her reflection. She tried to shake off the feeling that she had been thrown into the deep end of the pool, but it would not leave her. "Why didn't my father ever tell me?" "We all make our own choices, and he made his," Happosai answered. "Would you have believed him if he had told you?" "Probably not," Akane replied. She sighed and shrugged her shoulders. "It sounds pretty ridiculous." "I wish I had easy answers for you, Akane, but there aren't any." "I don't want easy answers, I just--"
Akane's words were cut short; a loud crash resonated through the air, making her jump. She looked to Happosai who stared wide-eyed back at her, and slowly turned her head toward the source of the noise. Through the window, she could see a familiar-looking figure lunging toward Ranma; a flash of sunlight, reflected from the blade of a sword, danced across her vision for an instant. She leapt to her feet without even realising she had moved. "Ukyo," she mouthed silently, and reached for her sword, glancing back momentarily to Happosai. "Stay here." Ranma snarled and flung her sword upwards at Ukyo's blade, blocking the frenzied swing easily. Dropping low, she riposted, the tip of her blade narrowly missing her opponent as the other girl dodged to one side. How the hell did she sneak up on me? Ukyo stepped back and lowered herself into a loose stance, the urgency of her initial attack vanishing with the element of surprise. Her face carried a vicious determination, eyes gleaming in the evening sun as she stared intently at Ranma. "You thought you could fool me by playing dead?" she spat, her words acidic. She huffed with contempt, narrowing her eyes. "Leave now or I'll kill you," Ranma said, a hard edge to her voice. "I don't have time to deal with you interfering." "I'll leave when you're dead," Ukyo countered, slashing out with a lighting-fast strike toward Ranma's face, which was effortlessly blocked and countered with an opposing swing that was just as easily parried. "You still don't get it, do you?" Ranma asked, incredulous. "How can you not understand by now?" "I understand perfectly," Ukyo countered, accompanied by another experimental slash in Ranma's direction. "I understand that when I kill you, my mother can finally rest. I _will_ have my revenge." "I've had enough of fighting with you," Ranma growled, edging in a circle around her opponent. "You can't hope to win, so just leave, and you won't die." "Thank you for your concern," Ukyo replied, her voice dripping with sarcasm. She launched her sword forward once more, pushing hard against Ranma's blade as it moved to block. "I'll remember it when I'm digging your grave." Akane's voice rang like thunder through Ranma's mind, instantly commanding her attention. She whipped her head around to stare as the Tendo girl charged toward them, her sword drawn. One glance at Akane's face told Ranma exactly what the girl intended to do; a cold panic sank into Ranma's stomach, rooting her to the spot. Ranma realised her mistake the moment she made it. In her mind, she pictured how Ukyo would have reacted to her opponent looking away in the middle of a fight - if she had been in Ukyo's position, she would have done the same. If your enemy presents an opening, you take full advantage. It was a basic principle, one she had learned centuries ago, and yet, it had slipped from her mind so easily. She pictured the scene, imagined Ukyo raising her leg, cocked at the knee, flattening the foot out and readying the release of tension that would begin the kick. She wondered, for only an instant, if she could manage to twist herself aside to dodge the kick, or deflect it with her arm - anything. Her body refused, insisting that she stay motionless, gaze locked upon Akane's face as the Tendo girl charged wild-eyed into the fray, bright blue eyes burning with righteous intent and overwhelming naivety. Shoryoutensei gleamed in the evening sun, its futile swing defeated before it had even begun. She doesn't understand, she doesn't have a chance. Her mind sped through the possibilities, the various moves she could make to best protect her ward. Her ribs were broken on the right side, but if she rolled that way, she would be able to gain a position between Akane and Ukyo, keeping the two safely apart. That, she decided, would be the best option. One thought tugged at her mind, a niggling doubt that refused to be ignored; and as Ranma listened, the quiet doubt was amplified into a screaming realisation. The pond. Gods, I'm heading toward the water. She twisted, trying to alter her path even as the icy cold water engulfed her; the frigid chill spread down her body as she slowly sank. She struggled, thrashing; however, her efforts were for naught, and she could do nothing but watch helplessly as the liquid hardened into solid ice around her. Akane swung her sword with mighty force, charging full speed at Ukyo. The strike was easily parried, but her momentum carried her into the other girl, sending them both stumbling. "You again," Ukyo growled, catching herself on a nearby tree. She pushed herself off from the trunk, and lowered her sword. "Stay out of this!" "I won't," Akane countered, recovering her balance and straightening. She raised her sword, punctuating her words with small movements of the blade. "I won't let you hurt her." "I have no argument with you," Ukyo said, a sharp, threatening edge to her words, "but I will kill you if you try to stop me." Akane narrowed her eyes, looking her opponent up and down. The girl was wiry, but agile; seemingly quite fast, and strong to boot. Akane swallowed, knowing that she would not defeat Ukyo easily. That was certainly not going to stop her from trying. Ranma had leapt to her defence on two occasions now, with no hesitation, with no concern for her own safety. Even if she didn't entirely believe Ranma, or fully trust her, she was damned if she was going to let this girl hurt her. Ukyo had escaped from their last encounter; this time, she would not be so lucky. Akane slowly circled around Ukyo, stopping as she came into position between her opponent and the pond. She dropped into a defensive position, making her intent clear. "All right, dragonkin," Ukyo said, her voice strangely calm and even. "If that's the way you want it - you'll die this day." Akane was put on the defensive immediately, a series of crisscrossing strikes at head height forcing her to dodge and weave, the blade of Shoryoutensei seeming suddenly quite inadequate as a shield. She struggled for position, trying and failing to advance as she was held back by the flurry of attacks. She's fast, she thought, planting a foot firmly into the soft earth behind her to anchor herself in place. Fending off blow after blow from all angles, she struggled to push Ukyo away, to create some space for herself to launch a counterattack. Obviously, Ukyo had far more swordfighting experience than Akane, and it was tipping the odds in her favour. A glancing blow ripped past Akane's wrist as the two swords clashed, hot pain stinging her arm as a stream of blood spurted out from the wound. It burned at her skin, feeling intensely hot against her icy flesh; she winced, her sword beginning to wobble with each impact as her weakened hand struggled to maintain her grip. "You fight like her," Ukyo spoke across the gap between them, her voice drifting at a leisurely pace amid the lightning-fast motion of two opposing swords. Akane growled in frustration, unable to spare the concentration needed to reply; her attention was far too focussed upon the sharpened metal that threatened to slash her head open. She was acutely aware of the red-hot blood that dribbled down her forearm, only to dribble from her elbow down into the fabric of her gi. Gods, she thought, it feels like I'm bleeding to death. A vicious swipe toward her stomach almost went unchallenged, forcing Akane to twist her wrist painfully to fling Shoryoutensei into its path at the last moment. The impact sent shockwaves rumbling down her arm, a shriek of agony escaping her as the stabbing pain in her wrist grew worse. She fell back to one knee, straining to keep up with Ukyo's lightning speed, the hail of blows simply too fast for her to cope with. The edge of Ukyo's blade grew closer and closer with each strike, the tip leaving sharp, narrow cuts along her arms and shoulders as it grazed against her. "Give up," Ukyo said, dull, impassive eyes staring directly into Akane's. "You may be her kin but I don't want to kill you." Akane shuddered as she looked into the empty, soulless eyes of her opponent. They did not shine with anger, or venegance, or emotion of any kind - they simply stared straight at her, serving their purpose and nothing else. In that instant, Akane realised that Ukyo did not care about this fight, or whether Akane lived or died. Akane was little more than an obstacle to her, an obstacle to be removed. Why, then, was Ukyo toying with her? Perhaps, Akane realised, her eyes widening, she's not toying with me. A bead of sweat rolled down Ukyo's forehead and as she exhaled, a large puff of frozen mist rose from her mouth - a testament to how hard she was breathing. She's wearing herself out. She's going as fast as she can. The sweat dripped from Ukyo's forehead, tumbling silently down from her skin into the air below, and as Akane watched, it slowed and hung in place, glimmering at her with a tiny white light. Silence filled Akane's ears, the ringing sound of two swords clashing echoing into silence around her. Ukyo stared at her, locked in an instant of time; Akane looked back at her, letting out a slow, shaky breath as recognition set in. It happened again, Akane thought to herself. How did I do that? She quickly dismissed that line of thought; there were more important things to do. Her sword hand still complained loudly, the throbbing pain no less intense, the touch of her blood no cooler. Thinking quickly, she raised her other hand instead and brought it forward, just as she had in her fight with Ranma, flattening the palm out and driving it upwards to strike the centre of Ukyo's chest. The moment her hand made contact, the world sprung back into motion around her - Ukyo was flung backwards, a look of utter shock gripping her face as her body was launched into the air, only to come crashing down amongst the trees that circled the clearing. Akane instinctively ducked her head slightly and closed her eyes as Ukyo's sword flew from her grasp, the impact of its blade upon Shoryoutensei sending it spinning past Akane's neck - a gasp of wind running over her skin as it whirled past, only to bury itself in the ice of the pond. She stood still for a few moments, paralysed by the shuddering realisation of just how close the sword had come to her neck. A shiver ran down her spine as the sensation of wind running over her neck refused to leave her mind. The aching sting of her wrist quickly brought her back to reality, and as she opened her eyes, the sight of a motionless Ukyo bent over the broken trunks of three trees greeted her. She blinked, failing to comprehend just how she had managed to hit the girl that hard. I barely touched her, she thought to herself, glancing down at the hand in question. Her fingers were still soft, delicate, her hand possessed of the same feminine form it always had been; yet, it seemed imbued with the strength of a demon. Ukyo's groan distracted her, and Akane quickly stepped over to the limp form of her opponent. A gust of wind blew past as Akane looked down into the broken clutch of trees, the long, low creak of torn wood shifting in the breeze breaking into the silence. "You win," Ukyo groaned, unable to lift her head or open her eyes. A stream of blood trickled slowly from the edge of her mouth, pooling at the base of the tree trunk that supported her weight. She coughed, choking on the warm, thick liquid. "I've never seen an attack like that." Akane said nothing, her sword lowering as she listened to the ragged whine of Ukyo's breath escaping from within her crushed chest. The brown-haired girl managed to open one eye, the eyeball rolling forward to present its dialated pupil after a moment. Her face carried the same lack of emotion it had during the fight - losing seemed as inconsequential as winning, or so it seemed. "Finish me," Ukyo rasped, her chest rising and falling with short, rapid gasps for air. "Let me die with honour." Akane slowly raised her sword, pointing its tip at Ukyo's neck. She swallowed, her mouth dry, her sword hand shaking. The creature before her was truly a pitiful sight, a bent and broken girl, her skin growing paler by the second as the rusty-hued blood collected in ever larger quantities in the soft earth below. To stare into those pitch-black pupils felt to Akane as though she were being sucked into a deep, empty, silent void, the absence of feeling washing over her, overwhelming, its intensity staggering her. She shook her head, tearing her gaze free, and forced herself to turn away. She could not kill this girl. "I ... I won't," she said quietly. "I can't." "Coward," Ukyo called, her voice grating as air competed with blood for passage through her mouth. She raised her arm, screwing her eye shut in agony as pain lanced through her body, gritting her teeth as she forced it to reach toward a small handle that protruded from a pocket on her thigh. Akane felt the presence of the small dagger as it hurtled toward her, understanding exactly what it was and where it was going. She tossed herself to one side, launching herself out of its path, but did not move swiftly enough - the blade impacted against her back, piercing her skin just below her shoulder. The agonising pain of the blade skewering her flesh sent her tumbling, falling to her hands and knees as the momentum of the attack pulled her body off balance. She landed roughly, her still-bleeding wrist's scream of pain joining the chorus that echoed within her from her many new wounds. She rolled, slumping onto the ground, and did not move. Ukyo struggled to move, pulling herself upwards slightly against the tree trunk with one hand, her movements slow and shaky, her body convulsing with every beat of her heart. A loud crack filled the air, a high-pitched hissing noise following in its wake; Ukyo barely had time to glance toward its source before an enormous slab of ice slammed into her body. Ranma stepped out of a gaping hole in the pond - her cloak little more than a puddle left behind in the ice - and held aloft her sword, the water on it hissing as it turned to steam. A snarl of rage tearing through her lips, she leapt toward Ukyo. Ranma shoved the tip of Garyoutensei down into the icy slab that held Ukyo down with brutal force, shattering the block with ease. Smaller fragments of ice toppled off Ukyo's body, leaving the semi-conscious girl exposed beneath the rapidly-melting ice that remained. Garyoutensei quickly disappeared back into its sheath as Ranma bent down toward the girl. "You snuck up on me and attacked without warning," Ranma seethed, her voice shaking with fury as she reached down to grab the front of Ukyo's tunic. "That, I didn't mind." "You waited until I was distracted and hit me with an attack I couldn't block," she continued, yanking Ukyo from the ground and holding her limp form up with both hands. "That didn't bother me." "You buried me in a solid block of ice and left me to rot," she said, her voice much more quiet, calm in its rage. Swinging Ukyo like a rag doll, she slammed her opponent into a nearby tree and let go, watching as the brown-haired girl slumped to her knees against the rough bark of the tree. "That didn't matter." "Then you attacked my student, my Akane, while I couldn't protect her," Ranma finished, her voice barely a whisper. One hand ripped Garyoutensei from its sheath and held it aloft as the other grabbed Ukyo's hair and tilted her head back. "For -that-, you will die." With furious strength, Ranma brought the gleaming blade of Garyoutensei down upon Ukyo's neck, closing her eyes as the moment before the impact. There was a slight resistance, and a dull thud as the blade buried itself in the wood of the tree. She held perfectly still for a moment, a smile crawling across her face as the stink of burning flesh filled the air. Releasing her hold on Ukyo's hair, she pulled her sword free from the tree trunk. The dull thud of Ukyo's head falling to the earth below resounded through the clearing, followed only by silence. It was done. Ranma tossed the small blade aside, quickly turning her attentions to the wound on Akane's back. The Tendo girl moaned slightly, shifting a little, but otherwise did not react. With panic tying her stomach in knots, Ranma frantically tore open Akane's gi and pulled the top from her body, rolling her onto her stomach to tend to the injury. "Happosai!" she called again, her hands frantically mopping up blood with the material of Akane's gi. Where the hell was the old man? The blood poured out at an alarming rate, staining Akane's skin, despite Ranma's best efforts to staunch the flow. No matter how fast she worked, it did not seem fast enough. The blood was warm, a constrast to Akane's cold skin. "Ranma," Happosai called from the doorway of the cabin, hobbling along with his cane, his movements stiff and slow. "I'm sorry - I fell in the panic - I think my ankle is-- what happened to Akane?" "She's been hit badly," Ranma shouted in reply, her voice wavering with panic. "She's bleeding all over the place. I can't heal a wound like this - you've got to help!" "Don't panic, don't panic," Happosai replied, hobbling down into the grass and making his way over toward Ranma. "How the hell can you say that?" Ranma cried, pressing the balled-up fabric up against the wound, applying pressure to it. She spared Happosai only a momentary glance. "She's dying!" "She's not dying," Happosai answered, stepping up alongside her. He slowly raised his cane and nudged aside a part of the fabric, exposing the bottom edge of the wound. "Look." Ranma looked where Happosai was pointing, and sure enough, the wound was beginning to pull itself closed. Slowly, but surely, the wound was beginning to disappear. She quickly pressed the fabric down over the wound again and looked up to Happosai once more. "She's already learned to heal herself," Happosai said, pulling the tip of his cane away. "She really is quite impressive." "You're sure it will heal completely?" Ranma asked, bloodied hands holding the fabric tightly in place. "I don't want to risk taking her to a hospital, but--"
"She'll be fine," Happosai reassured. "Just keep pressure on the wound to slow the bleeding until it heals." "None of the others were like her. She really is ... unique," Ranma said quietly, looking down at the deeply stained skin of Akane's back. She ran her hand slowly over it, the warmth of the blood feeling strange to her fingertips. "I've failed her already, Happosai. I let her get hurt." "Yes, you have," Happosai replied, his voice stern. "You've placed her in harm's way, and this is the result. Don't fail her again." "I won't," Ranma replied, gently lifting Akane's body with one arm as the other kept up the pressure on her back. Slowly, she raised Akane's body and pulled the girl's back up against her chest, embracing the girl. "I'll keep her safe." "Be mindful, Ranma," Happosai warned, reaching to gently touch Ranma's shoulder. "You're not what you once were. Remember that - don't overestimate yourself." "I know, Happosai," Ranma replied, squeezing Akane gently to her. "I ... I know." "She will be fine," Happosai said, his voice warmer. "Treat it as a lesson; learn from your mistake." "We'll have to leave this place," Ranma said, closing her eyes as she held Akane against herself, concentrating on the feel of her companion's heartbeat, trying to convince herself that as long as she could hear it, everything would be fine. "Indeed," Happosai replied, his voice already a small distance away. He looked into the group of broken trees, curling his lip in disgust at the stench that eminated from within. "So, here lies Ukyo Kuonji. Did you -have- to kill her?" "Yes," Ranma replied in a low voice, her hand tightening around the reddened fabric. "She brought it on herself." "Akane won't understand," Happosai said, lowering himself to one knee beside Ukyo's head. He winced with pain as his back and ankle both complained simultaneously. "She'll be angry. You won't gain her trust by killing people." "It had to be done," Ranma said, lowering her chin to rest on Akane's shoulder. She gently rocked back and forth, willing the blood to stop flowing. Please, Akane, be okay. You can't die. "She has such a beautiful face," Happosai observed, sadness in his eyes. Gently running his hand across the fringe of her hair, he let out a sigh. "It breaks my heart to see a beautiful girl killed." "She had her chance," Ranma muttered, her irritation growing. Why the hell was Happosai more concerned about Ukyo than Akane? "If she found this place, the others can't be far away," Happosai speculated, glancing away from the bloody mess that was her body, still slumped against the old tree, covered in the blood-soaked mud that surrounded it. "Keep her safe, Ranma. She's your responsibility now." "I know," Ranma replied. "As soon as this bleeding stops, I'm taking her out of here." "That would be best," Happosai agreed, a tinge of sadness tainting his voice. He turned his gaze to the cabin, a mournful look upon his face. "You know what must be done," Ranma said, holding Akane tight to her. "I'm sorry." "Yes," Happosai replied sadly, with a slight nod of his head. He sighed, and glanced to the pond. "It's a shame - I enjoyed living here." The sun had long since abandoned the sky, the moon keeping silent vigil amidst the stars as a chilly night wind danced through the trees, the forest seeming calm and peaceful on this serene night. The night was not serene, however; the forest was not peaceful. A shaft of light whipped across the grass of the clearing, scattering the darkness with the speed of its motion. It was joined by another, and another, and many others, as a group of black-booted soldiers moved swiftly and silently to surround the clearing. With absolute precision and disciplined efficiency, the soldiers encircled the clearing, the bright beams emitted by their flashlights exposing all of the forest's secrets, leaving nothing undetected. The perimeter secured, the soldiers began to move in. Their lights quickly passed over the surface of the pond, several moving to a large pile of broken wood and rubble that lay nearby. Slowly they moved toward it, flashlights flitting back and forth to illuminate the pile. "Phoenix, this is Alpha," spoke one of the soldiers, holding a hand up to his ear, his submachine gun held tightly by his side. "Perimeter secured, the clearing has been abandoned. It looks like there was a building here, but it has been demolished." "Spread out and search the surrounding area," he said aloud, glancing to the members of his team. As one, the other soldiers turned away and stepped into the darkness. One soldier, however, moved into the clearing and approached his leader. "Sir," he said, gesturing with the light attached to his gun, "I found a body in the woods." Alpha team's leader stepped over to the other soldier, raising his gun to shine his own light upon the broken cluster of trees. A thoughtful look crossed his face, and his hand immediately returned to his ear. "Alpha reporting," he spoke, keeping his flashlight trained upon Ukyo's body. "We have located the secondary objective, but have not acquired the primary." A moment passed; the reply was brief, a few words spoken through the soldier's earpiece. He glanced back and forth, scanning the edge of the clearing as he listened. "No containment necessary," Alpha leader replied, "she's dead." Again, a moment passed and the soldier nodded as his instructions arrived. "Sir, yes sir. Bravo team, move in to scour the rubble. Bring the chopper down, we have a body to transport." "We're still taking her?" the other soldier asked, glancing to his leader. "Clean her up and prep her for transport," the leader replied with a nod of the head. "She's going to the lab."